It's all there on page 16 of the factory drivers manual, unfortunately the text is in German. " Wenn der motor seine betriebstemperatur hat max. 80 wasserthemperatur sollte unbedingt darauf geachtet werden, dass bei standzeit der motor abgeschaltet wird, da anson die gefahr des uberhitzens besteht ". The manual I am referring to is for a 1981 Porsche 924 GTR that were made in limited numbers, no more than a couple of dozen tubs were ever built, for FIA Group 4 and IMSA GT racing. In typical Porsche thinking, several prototypes were built the previous year and put through the usual stress tests before a version was made available for customer teams. Three prototypes were entered for the 1980 24 Heures du Mans, one for a German team, one for the Brits and the U.S. with Al Holbert and Peter Gregg to pedal along. After a road accident sidelined Gregg, the factory enlisted the services of one Derek Bell. The road going 924 Turbo ( type 931 ) had just been introduced and Porsche, as usual, saw the wisdom of having a race version of a production car participating in the most famous sports car race in the world. The 924 GTP prototypes had the usual Weissach touches courtesy of famed engineer Norbert Singer. Titanium everything, axles, wiper shafts, a dash panel that weighed a couple of pounds, center lock wheels, brakes from the 935, etc. The 1980 race was one of wettest in recent history and the balanced handling of the 924 chassis was to be of great benefit as the underpowered GT simply drove around the much faster prototypes in the rain. The slower pace helped get all three cars to the finish posting overall results of 6th, 12th and 13th place. Pretty good, huh ? Not having the funds to purchase 924-003, it went to David Morse ( no relation ) to join his stable of Porsches including the Martini 936 that finished 2nd at Le Mans in 1980. The point being that he would have the un-official non-werks entry in 936- 004 ( stupidly badged as 908-80 and amazing how many tosspots reported it as a homebuilt car by Joest ) and a real werks Porsche System official car. Fade to present day August 2007, the 34th running of the Monterey Historics at Laguna Seca. A tribute to roadsters that dominated Indianapolis before the rear engine revolution took over. Having cemented their popularity the year before, is Group 7 consisting of cars from the IMSA era, mostly 1972 through 1982. Porsche turbos, RSR's, Ferrari 512 BBLM's, DeKon Monza's, even a Ford Capri. By this time 924-003 had been repaired and moved back east where it lived in a collection of Porsche auspuffers that included your usual example of greatness in the form of a 917/30. Showing little restraint or manners, I called the owner, Matt Drendel and asked if I could have 924-003 for another chance at Monterey as I felt I had unfinished business with the car. For some idiotic reason he agreed with the warning if I break it, I fix it. 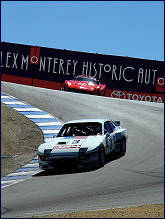 I sent in a last minute late entry for the Monterey Historics and was accepted. I suit up and head out for Friday practice, this is a large group of close to forty cars and drivers of varying abilities, that also includes myself but I am careful as this isn't my car and I am grateful to Matt Drendel for the chance to be back in 924-003. By lap three it is coming back to me, the car is quick, the boost rapid and a rocket on certain sections of the track. I have to watch my mirrors for upcoming 935's which have double the turbo horsepower but traffic is not much of a problem and I am able to go around a number of other competitors. Then at the top of the corkscrew ( always the top of the corkscrew ) the motor shuts off and the fuel pressure gauge hits zero. I coast back to the pits and after some discussion; Big Ron gets it fired up again on the reserve. Once back to the paddock, it is discovered the fuel filter is packed with foam shreds from a disintegrating fuel cell. The filter looks like a yeast infection. Big Ron gets it sorted and on the Sunday morning session I am confident and have a great on track battle with several RSR's. Then I hear that gurgle again and the text from manual needs no translation. I can see the damn temp gauge is past 80 Celsius. I shut the car down and coast down the corkscrew and back to the paddock. 924-003 won't make the main show. Again. Jurgen Barth, who had finished 6th overall in 924-004 in that famous 1980 running of les 24 heures, came over to ask what happened. The usual was the best I could grunt. He said that his GTP also had problems but as Le Mans was a long race you could sort out what was needed to fix the problem. Ten laps at Laguna Seca isn't the same thing. Too bad I didn�t feel the same way.